I always keep up with the news--it's just something I do. I don't care to be blindsided by something important. It takes a fair bit of my time, but I think it's worth it. The current big story is the economy, both in the US and abroad. The only way to miss this story is to crawl under a rock. A big rock, probably on another planet. It's everywhere you look. People are talking about the economy everywhere you go. It's the subject that can not be escaped. This is a Good Thing. It's good because people around the world are finding out that they have been lied to on an industrial scale for decades. "No, Virginia, there is no Santa Claus--at least not one who gives you unlimited money to go buy things that you probably don't need in the first place. Young lady, you should have never used your house as a piggy bank." "Yes, dear, I know that The Obama is trying to take his place. But you have to realize that he, like those who came before him, will fail. Just because he is willing to go further than any of his predecessors doesn't mean that what he is doing will work." Our global economy is on life support. The central bank doctors, backed up by government printing specialists, are hanging bags of money and running IV lines into every vein on the global economy's body that they can find. Their theory is that if we just pump in enough money, the patient will return to health--or at least blow up like another bubble. We're already seeing how that strategy is failing. Stock markets around the world are in a deep and prolonged slump, with no improvement in sight. The word "depression" hangs heavy in the air. Despair is becoming the new trendy emotion. Some markets, such as firearms, ammunition and various sorts of emergency preparedness supplies, along with the precious metals markets, are going crazy. Tried to buy an AR-15 lately? How about ammo for it? Freeze-dried food (the kind suitable for long-term storage)? US Gold Eagles, Canadian Maple Leaves or South African Krugerrands? Everyone of these items is in short supply, and their prices reflect it. Why are these markets so hot? Because these are the things people buy when they're scared--scared of their government, scared of inflation and scared of civil disorder. Go to a gun show--you can smell it in the air. People are also growing angry. Rick Santelli and the Tea Party movement are evidence enough of that. If you want more, look no further than the level of outrage incurred by Obama's mortgage bailout plans. The pity of it is that they should be pissed at themselves, for acting like a bunch of drunken sailors on leave. They've had a hell of a consumer debt party, and the hangover is going to be a killer. And where the hell did that tatoo come from--the one that looks like the price tag for a big screen TV? Retirement savings plans, such as 401(k)s and 403(b)s, have tanked along with the markets that they were invested in. Baby boomers, once in sight of their retirement goals, are now planning on working a lot longer--assuming that they can keep their jobs. Unemployment at the national level is 8.1% and expected to rise. Some pundits say we could see it hit 10%, perhaps more, before this is over. Some of the boomers may not be able to retire--ever. People have rediscovered the concept of "saving" and they're doing it with a vengeance. The savings rate has went from a negative number to 3% in just months. Joe and Jane Consumer have closed their wallet, and as strange as it may seem, it's exacerbating the problems. In an economy that depends on consumer spending for its upward motion, the lack of spending causes big problems. Our government's attempts to replace consumer spending with government spending are working about as well as all of their other financial plans. Many of those who are saving are saving in very liquid items, such as old-fashioned savings accounts. Others, fearful of the state of the banking system, are keeping the cash at home. Expect to see more home invasions in middle and upper income neighborhoods as a result. Despite worries over deflation, food prices stubbornly refuse to drop. Once blamed on high oil prices, it now seems that it is, well, something else. There is no sure word on what it is, but I've heard everything from short supplies to hoarding by everyone from you and me to our government. Whatever it is, trips to the grocery store now hurt like trips to the gas station did 6 months ago. Retail stores are going out of business because of bad business decisions, a lack of credit and a lack of customers. Circuit City? Dead. Sears? Closing stores. Store closings in 2008 were bad; 2009 looks equally bad if not worse. One of the few who are doing better is Wal-mart. People who are still shopping are shopping down-market. What's left of our manufacturing base is hurting badly. GM is looking at bankruptcy. Cerberus Capital is surely ruing the day they bought Chrysler. Any company producing for the construction industry, from materials to tools to equipment, is in agonizing corporate pain. Any company producing anything outside of goods we want in a panic is hurting. So, are we in the midst of a collapse? Is it Road Warrior time--do we all need to stock up on Dinky-Doo dog food? I honestly don't know. I'm taking every precaution I can (short of moving to a fortress in the high mountain fastness) for myself and my family. John Mauldin, an economic pundit for who I have great respect, says there are some simple actions that could be taken that would turn things around in relatively short order. Others, like The Daily Reckoning, have hoisted the collapse flag and keeping track of our downfall, while calling on our governments to let the markets do their job (always good advice in my opinion). Whiskey and Gunpowder is doing much the same, while also pointing out ways that you can defend your personal wealth (assuming you have any left). One thing for certain--our governments aren't going to be what get us through this, no matter what the left would prefer. Their meddling, good-intentioned or not, is killing us. The price tag for it will kill our children and grandchildren. It's time to hunker down, and it's time for a gut-check. Despite the litany of bad news, don't fall into the twin traps despair and fear. Things will get better, even though there is no way of knowing when. Do what you can to prepare yourselves for riding this out. Max hasn't came over the hill just yet. But keep an eye peeled, just in case. Sanjay Gupta, Mr. Obama's nomineee for Surgeon General, "pulled his name due to family and career reasons". OK, I'll grant you the good doc just had kid #3,and I 've made career decisions based on wanting to be with my kids. But, me being me, I have to wonder if Obama's goal of "comprehensive healthcare reform" (which is leftist for "socialized medicine) played some role in the decision. As I understand it (from various things noted around the Intertubz), most medical professionals aren't that thrilled at the prospect of becoming government employees. ...as well as the guys in Afghanistan and the ones who have served and returned home. Major Chuck points us to Afghanistan Shrugged and their kickin' unit t-shirts. I got two--one for me and one for Daughter to wear to her JROTC PT workouts. $5 of each shirt goes to Soldiers Angels. ...why don't we just take a big ol' hammer to the Internet as a marketplace? It seems that our Congress is applying the same logic that has worked so well previously (enacting draconian legislation supposedly aimed at preventing crime that will instead have an out-of-proportion effect on those who don't break the law) to those folks who make their living selling goods online at sites such as ebay (no link; ebay hates gun owners, and we hate them back). It seems that the criminals are using 21st century technology to sell stolen goods. (I'm shocked.) While I have no doubt this is true, I can't see how making the life of x number of legitimate sellers untenable is going to help in catching the 1/x number of people who abuse the system. Then again, look how well this has worked with gun laws. I mean, we gun owners are only inconvenienced a tiny little bit in the pursuit of our hobby while it has stopped the bad guys dead in their tracks. Ron Kirk, nominated as U.S. trade representative in the Obama administration, owes an estimated $10,000 in back taxes from earlier in the decade and has agreed to make his payments, the Senate Finance Committee said Monday. I'm running out of snarky things to say about the subject. Anyone want to chime in? "The Democrats who now run Washington don't want to hear this..."
As 2009 opened, three weeks before Barack Obama took office, the Dow Jones Industrial Average closed at 9034 on January 2, its highest level since the autumn panic. Yesterday the Dow fell another 4.24% to 6763, for an overall decline of 25% in two months and to its lowest level since 1997. The dismaying message here is that President Obama's policies have become part of the economy's problem. As was widely predicted before the election, the Presidential Amateur Hour isn't so entertaining as the Hope and Change crowd thought it would be. Unless, of course, you like to watch the nation implode. A lot of people are started to ask themselves if that wasn't the plan after all. (Queue the black helicopters.) But remember, never attribute to malice what can adequately be explained by stupidity. However, I'm keeping my eyes open, just in case. It's a snow day here at The Freehold. I know that a lot of you are sick and tired of snow, but here in the Piedmont area of North Carolina, we just don't get it all that often. I'm bagging work for the day and going to get some things done. Blogged about how Obama is a rank amateur and is screwing up the country? Check. Blogged about the 5 inches of man-made Global Warming on the front yard? Check. Crap. I knew I was forgetting something. 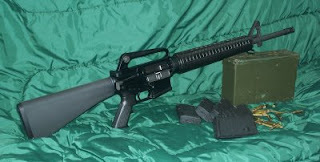 This is the latest addition to the collection, a Bushmaster XM-15 in A2 configuration. This delightful gun comes with a collection of P-mags and several hundred rounds of shiny military contract overrun ammunition. And if we're really lucky, somewhere a gun grabber's head just went all explodey. Team O is finding out that Hope and Change aren't much of a match for the real world. While it's all blue sky and puppies to talk about a major makeover of the United States (into the United Socialists, even if most of them are too ignorant to realize their role as useful idiots), the real world is starting to push back. Once again, we find major financial corporations like AIG coming to the feeding trough government bailout wizards, empty balance sheet in hand, asking "Please sir, may I have some more? ", like some modern day Armani-suited Oliver Twist. Other financials, saddled with assets that no one can adequately value, continue to drag down the markets. Continued bailouts and "stimulus" prevent the markets from carrying out the sentence passed by the Court of the Free Market (death and dissolution), prolonging the agony for those of us who actually have to earn a living. Team O is also finding that something as simple as their laughably monikered "citizen involvement" just doesn't work as simply as it did when they were out in the real world. The Enlightened one is also finding himself being slowly painted into a corner, as his globalist compatriots take up the call for a "global New Deal", which sounds distressingly like the same old deal. Hey, pal, you started it, and now they're going to take you up on it--with the US taxpayers financing it, no doubt. The Father of Clean Government is also finding himself saddled with yet another appointee who habitually dipped into the till--up to his elbow. And to make matters worse for the Big O, the Shade of Ayn Rand is now walking to earth, stirring up the likes of Rick Santelli and holding tea parties across the nation. Sales of Atlas Shrugged are at an all time high as a new generation is having their faces rubbed into the simple fact that government is not a solution to their problems. And me? I'm just sitting here, amused as hell, considering if I too should shrug. I simply have to smile when the leftists of Hollyweird trot off on one of their globalist lovefests, and then have the love tossed right back in their faces. And what a story it was. Paul Harvey, probably the most recognizable voice on the radio, is dead at 90. As a young boy, off from school for the summer, I can remember the good times when my father wouldn't be traveling, and actually can home for lunch. His company had two old Jeeps that were used for field work (Dad was a land surveyor). I would wait in the front yard for him, and he would stop at the foot of the driveway and let me ride up with him. There were no doors and no seat belts, and that short ride was a Big Deal for me. After lunch, he and my mother would adjourn to the back porch, to drink coffee, smoke cigarettes and listen to Paul Harvey on a cheap Japanese transistor radio (which he still owns). "This is Paul Harvey--stand by for news!". I played in the area, half listening to the radio, understanding maybe 10% of what I heard. Mom and Dad understood it all. Sometimes they would be angry, sometime amused. They listened every day. If my Dad was traveling, my Mom listened alone on the porch. As I got older, I listened to him on a semi-regular basis, whenever I was in range of a radio that could get a station he was on. I became addicted to "The Rest of The Story", a program that would give the backstory (as we now call it) of famous figures. For some years I was actually able to listen every day on my drive home from work. Rest in peace, Mr. Harvey. You are another of the people of my past who made me who I am today. Thanks.